And so I’ve used the Kabuto (formerly OGK) Ibuki flip-up modular helmet for over 2,000km now. I bought this as an early Christmas present for myself and have blogged about my initial impressions of the helmet here. And since then, I’ve used it in almost every weather condition typically experienced in this part of the world – from hot 34degC afternoon sun, to super humid late afternoons, to cold mornings, day, night, light drizzles and even super heavy torrential downpours. That’s me and the brand new Kabuto Ibuki before coming out of the store. First and foremost, I’m extremely impressed with the overall construction and quality of the helmet and paintwork. I purchased the pearl white version and the hint of pearl glitter on the paintwork seem to scream “premium quality”. Applying a layer of wax (which I typically do to protect the helmet’s paint finish) makes the helmet very, very slippery to hold just by it’s painted surface. In fact, the paint finish on the Kabuto makes my former Lazer Corsica helmet look really cheap and “plastic-ky” by comparison. All three vents (front-top, rear-top and chin) worked very well with little play and feels extremely solid. The drop-down internal sun visor’s operation is smooth and continuous – and can not only be in the fully-opened or fully-closed positions, but also stays quite securely in any positions in between. Like many other reviews, I did wish that the internal sun visor would come down just a tiny tad bit lower. But in reality, this wasn’t an issue at all once I got used to it. Since this is my first flip-up helmet, the chin bar opening mechanism on the bottom left of the helmet didn’t bother me. Some riders may have preferred the chinbar release to be in the centre of the helmet. But I actually liked it to be at the side for 2 reasons. Firstly, it prevents accidental hit on the chin curtain, risk damaging it. Secondly, since the chinbar release is to the side, the visor opening tab is in the middle instead. I find myself opening up the visor far more frequently than opening up the chinbar. And so I appreciate that being in the middle, I can crack open the visor quite easily with either hands. 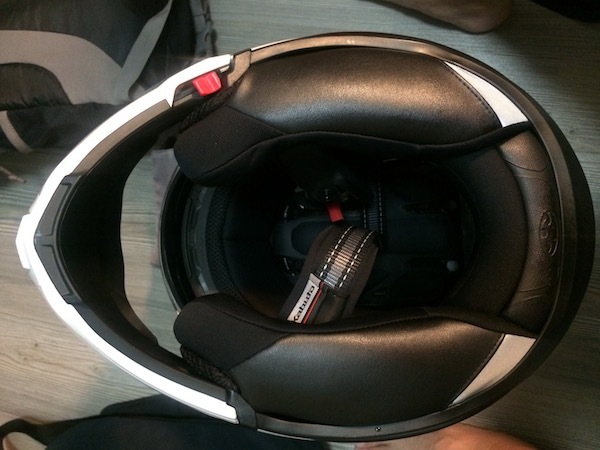 Other flip-up’s such as the Shoei Neotec, has the chinbar release in the middle and the visor opening tab to the side. Speaking of chinbar release, I have 2 issues with it. First, there seem to be some plastic creak on the left hinge of the flip up mechanism. It squeaks every time I flip the chinbar up. This was quite easily solved with a small squirt of silicon lubricant into the hinge. Secondly, perhaps it’s still rather new, I found the chinbar occasionally difficult to lock down. When the helmet is on my head and the chinbar lifted, sometimes after moving the chinbar gently down, I’m still not sure if it’s locked down. As there seem to be no (or just a very soft) positive click, I would always double check if it’s indeed locked down by attempting to push it up again. Occasionally, I would find that the chinbar wasn’t locked down and manage to push it up. So, to reduce the occurrence of this, I now tend to “slam” the chinbar down, increasing the probability of it latching onto the lock mechanism. The cushion material is made of moisture-wicking coolmax. Very comfortable and the areas in contact with skin really does feel cooler than my previous Lazer helmet. Overall, it feels plush and super comfortable. The inside of the helmet fogs up rather easily – especially in rain and high humidity environments. I initially didn’t install the included Pinlock insert and found the helmet to be difficult to use under rain due to the fogging up on the inside of the helmet. With the Pinlock insert installed, it beautifully prevents fogging – even in rain and very wet environments. While the Pinlock insert works magically during high humidity environments and is almost invisible in the day, I found that because of the introduction of the additional layer of moisture-absorbing pastic, night time use created some very distracting double reflections of lights. So I didn’t really like using the Pinlock insert. Horizontal field of view of the Ibuki is superb with very little blind spots. But I found the vertical field of view of my previous Lazer helmet to be superior to the Ibuki. That said, I noticed that the Lazer Corsica has an unusually large visor area and the Ibuki has a more “regular” visor area. While I could live with the Ibuki’s vertical field of view when the visor is either fully opened or fully closed, what I really disliked was the 1st “crack-open” position of the Ibuki’s visor. With the chin curtain on, and in humid environments, I had to occasionally “crack open” the visor to introduce some fresh air into the inside of the helmet as it gets very warm and humid inside. At this 1st “crack open” position, it’s difficult, if not impossible to read my speedometer at my normal riding position without having to tilt my head down a little. This is one area with the Lazer did very well. The underside view of the Kabuto Ibuki. And in my experimentation, I chanced upon a combination that seem to solve ALL the above problems. Remove the Pinlock insert and remove the chin curtain. Without the Pinlock insert, I no longer experience double reflections when using the helmet at night. This also means it’s easier to clean the inside of the visor as the polycarbonate visor has a scratch resistant coating while the Pinlock insert is prone to scratch damages. But wait! What then about the fogging up issue? Now with the chin curtain removed, air flows a tad bit more freely from the chin area and upwards into the front cheeks, nose and mouth areas. This quickly removes the humid breadth during exhale, and I found that the inside of the visor won’t fog – even in super heavy rain (yes, I’ve ridden this configuration in one). Yes, my chin may get a little wet (who cares? ), but that fresh, cool air in a super humid environment was refreshing and very, very welcomed! With the chin curtained removed, I no longer needed to crack open the visor for some cool air relief, which also meant that the helmet kept its waterproof seal. 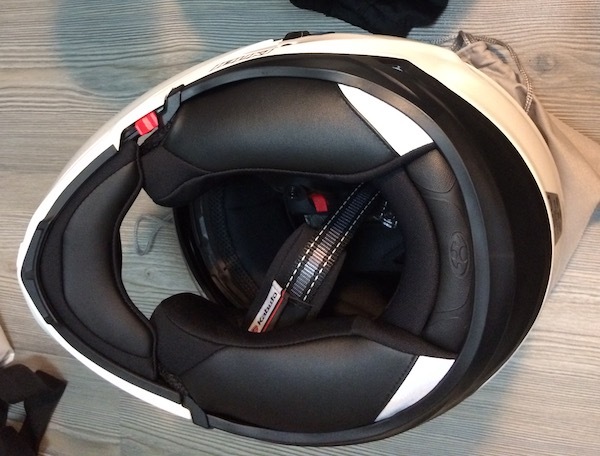 With all vents closed, chinbar down, and visor down, I was riding happily in the (heavy) rain and not a drop of water entered the INSIDE of the visor – yet still comfortably cool due to the air from the chin area hitting my chin and front cheeks. Kabuto Ibuki with chin curtain and Pinlock insert removed – my current favourite riding combination. Also, I found this combination to be excellent riding in Singapore’s typically hot and humid weather. While the extra chin ventilation generated slightly higher noise levels (I always use ear plugs anyway), I found the cool air very welcoming and definitely added to the riding pleasure. And yes, I tested this combination on the Malaysia NSHW, let’s just say, at various speeds not only at the indicated 110kmph limit. Yes, it worked very well. At 1771g for the large shell, the Kabuto Ibuki flip-up modular helmet – constructed with what Kabuto calls “advanced composite technology” – feels neither light nor heavy. It seem to have a nice balance on the head even with the chinbar opened. Kabuto’s wind tunnel test on their helmets. 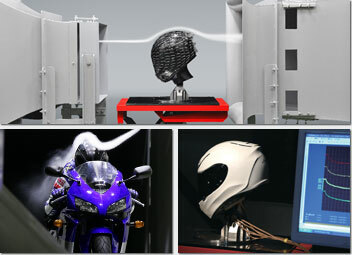 Unlike some lower end brands (or even some more expensive brands), Kabuto wind tunnel test their helmets. The patented “Wake Stabilizer” system seem to work very well. In my recent tour around Peninsular Malaysia, I intentionally tested this on my highway rides. Yes, I found that turning and tilting my head while traveling at highway speeds didn’t give me that “slap in the face” feel that I was so used to with my previous Lazer Corsica Z-Line that I used for my SE Asia tour. This makes clearing of water droplets on the visor exterior by head turning into the wind such a breeze (pun intended). Kabuto’s wind tunnel test and the patented Wake Stabilizer. 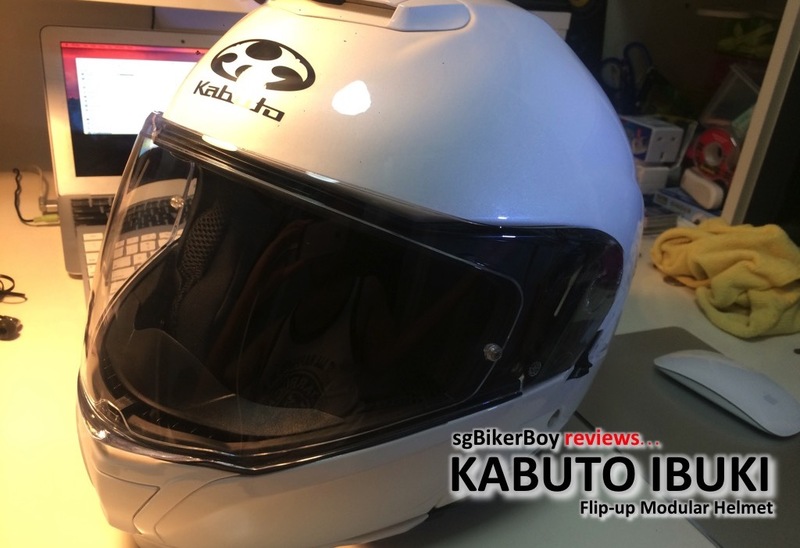 Overall, for a S$289 (USD 203) helmet that I picked up from RacingWorld Singapore during a sale (usual price S$578), I’d say the Kabuto Ibuki flip-up modular helmet provides an amazingly excellent value. 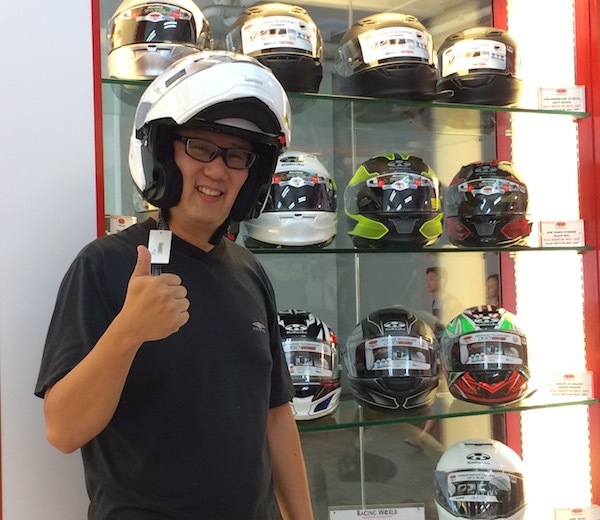 I was almost on the verge of shelling out some S$600 on the Shoei Neotec, but the Kabuto gave me everything I wanted for less than half that price. Hi, I’ve seen your review for both Lazer and this Ibuki. Can i assume that based on your experience, you would recommend Ibuki? When i just passed my 2b, i bought a Caberg but sold it right after a 10 mins ride as i was very new to riding. The helmet was considered quite heavy for me and i couldn’t exactly check my blindspot (yet) thus it was “safer” for me to use a half face helmet. After seeing your review, i figured i should invest a little more in a lighter weight modular (with the 50% promo). I would DEFINITELY recommend the Ibuki over the Lazer Corsica Z-Line without hesitation, if not for the excellent build quality of the Ibuki, then for poor quality (both in terms of the helmet itself, and the customer support – which I might explain in another post another time). Since you’ve tried the Caberg (Duke? ), what didn’t you like about it? Extra weight and reduced visibility as compared to open-faced helmets is a given for modulars and full-faced – it’s just physics. In fact, at about 1633g for a large shell, the Caberg Duke is amongst the lightest flip-up modular helmets out there! And quite frankly, if you find that heavy for you, then the Ibuki will likely not please you. Back then I used caberg when I rode for barely 1 week. But I think I’m ready for a modular now. I’m not sure if the promotion is still on, but at 50% off, the Ibuki was quite a steal. Next Next post: Passed my Class 2A License Test!